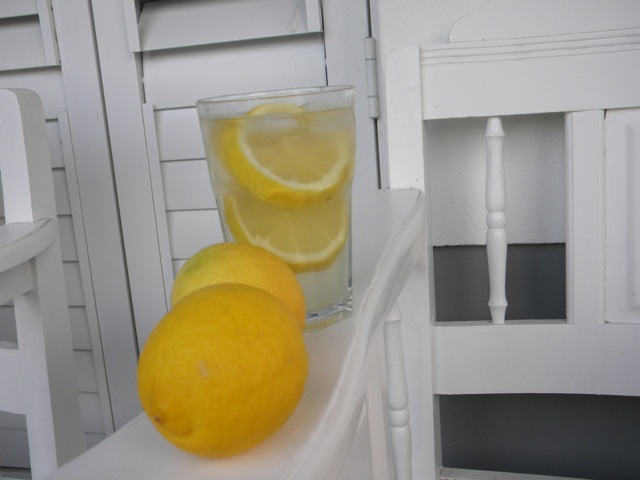 Confessions of a Hungry Woman: When Life Hands You Lemons. Make Lemonade. Literally. When Life Hands You Lemons. Make Lemonade. Literally. No, I'm not going all greeting card on you. I really have been making lemonade. The nice men who came to spray our 3 lemon trees against The Enemies of the Lemon Trees, picked them all off the tree and left them at our front door. Which was kind of them. But what to do with all those lemons? I've made lemon chicken ( in various guises), I've elegantly placed some slices in water to make me take in more H2O, I've made fresh lemon juice salad dressing and squeezed some for pancakes. I have even used one to play fetch with Max, to less than an enthusiastic response. And then I remembered my friend Lise's Boozy Vodka Lemonade. But did I phone her and ask for the recipe? No, instead I improvised. And have been left feeling slightly put out. I used 1 cup of freshly squeezed lemon juice, 1 cup of water, 1 cup of syrup and put it all on the stove. It felt decidedly unhealthy. I don't even take sugar in my tea or coffee, and here I was using a whole cup of sugar. Even I know that's not going to melt away my fat miraculously. But making lemonade from scratch made me feel wholesome. And I kind of liked that feeling. So I persisted. And having left the mixture to bubble on the stove away happily, I returned to find that the juice and water had evaporated, which I take it, is the point, and left all the sugary syrup behind. Enough syrup to make perhaps one litre of lemonade. 1.2 if I count the vodka... So clearly not what one would consider a health drink. But surprisingly delicious. And so I drank it alone. In the early morning sun. And felt very Desperate Housewife-ish. But in a good way, you know. Olive Oil Beauty Stuff. Good Enough To Eat.